An American woman moves to Cairo in 2003, converts to Islam and marries an Egyptian. She’s not a terrorist (though the State Department was very interested in her activities). She’s not an abused and mistreated Muslim wife. She actually writes for The Atlantic Monthly and Marvel—yes, she writes comic books. 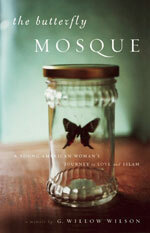 G. Willow Wilson has an incredibly interesting story (one of the many I discovered at the Festival of Faith and Writing) and The Butterfly Mosque is a glimpse into that story. She navigates a new religion and a new culture—effectively entirely new worlds—with poise and grace. She confronts stereotypes and subverts expectations. But it’s not just a defense of Islam and an attack on America. There are certainly critiques, but Willow works to keep a foot in both worlds. She’s uncomfortable being a bridge between the two, but she takes on the role in the ways she can (such as Ms. Marvel). It’s a great read. Perhaps my biggest takeaway is that things aren’t always what we expect and no single voice can speak for everyone, whether it’s religion or culture. The Islam we hear about from TV commentators is not the Islam that’s practiced by everyone. There are gradations. There are extremists everywhere. It’s perhaps most telling when Willow describes tenets of Christianity that I didn’t recognize as my own faith. Ironically, she was pulling from different threads to articulate her rejection of Christianity. It’s the same thing Muslims struggle with when Westerners have a monolithic perspective of Islam that just doesn’t exist in reality. Overall The Butterfly Mosque is a chance to embrace a diverse viewpoint and find some beauty and commonality despite our differences.